Note: some browsers (eg. Safari) auto extract zip files automatically. Right-click on the download link and select "Save Linked File As". This will allow you to download the theme as a zip file. Login to your site's WP Admin. Upload the theme.zip file (note: it is the theme.zip, not the theme-psd.zip that you just downloaded from the Member Area). 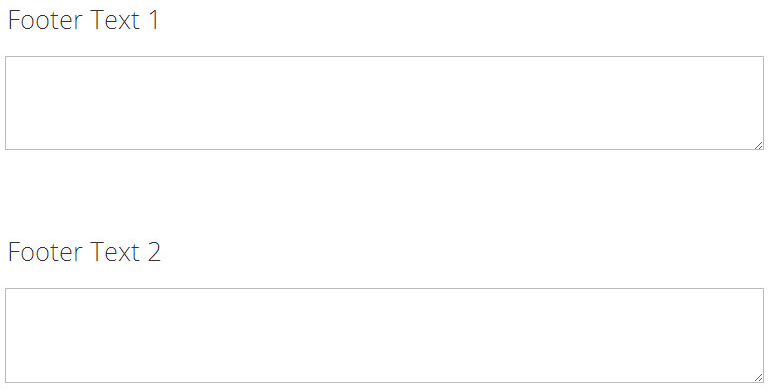 FYI: You can also install themes with FTP method. Read the Installing Themes tutorial for more info. If you are starting a fresh site, importing the demo content will help you understand how the theme demo is built. 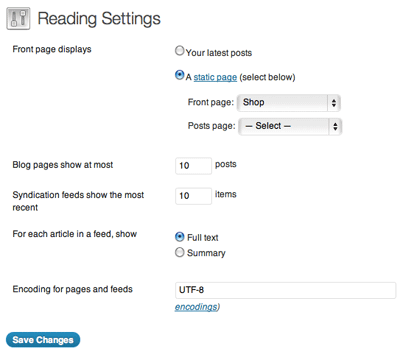 The Demo Import feature will import the contents (posts, pages, comments, etc. ), Themify panel settings, menus, and widgets setup from our demo to your site. You can erase the demo content afterward. 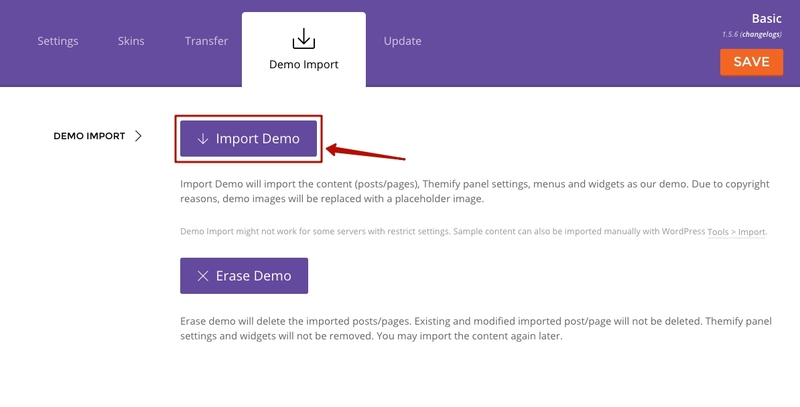 Go to WP Admin > Themify > Settings > Demo Import and click "Import Demo" button. Note that the featured images will be replaced with an image placeholder for copyright reasons. On the Demo Import tab, click on the "Erase Demo" button which will then remove the demo content. FYI: If the Demo Import does not work on your site, you can use the WP Admin > Tools > Import tool to import the demo content manually. Go to WP Admin > Appearance > Customize > Site Logo and Tagline. Under "Site Logo", select "Logo Image" radio button. Specify the logo image width and height. Scroll down and under "Site Tagline" select "Text" radio button. Go to WP Admin > Appearance > Menus. Click on "create a new menu" to create a new menu (eg. Main Menu). 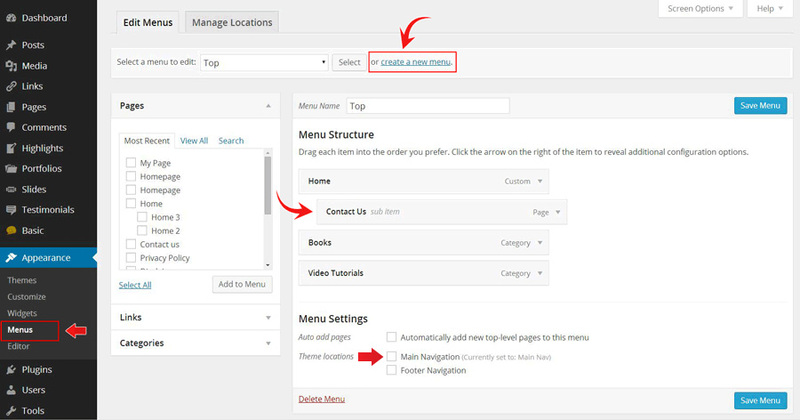 To create a dropdown menu: drag the menu item towards the right (the item(s) will be indented). When you are done adding the menu items, click "Save Menu". Scroll down to the bottom where it says "Theme locations" and tick the menu location checkbox. Footer Navigation = footer menu on the footer (Note: some themes might not have Footer Navigation). TIPS: You can display menus on sidebar widgets, remove the main menu, create empty links, and lightbox links. Read Custom Menus for more detailed tutorial. Go to WP Admin > Themify > Settings > Theme Settings. Under the "Exclude RSS Link", tick the checkbox that says "Check here to exclude RSS icon/button in the header". Under the "Exclude Search Form", tick the checkbox that says "Check here to exclude search form in the header". 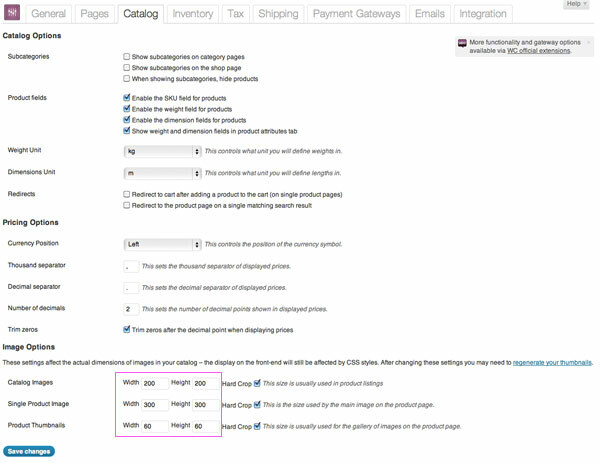 Note: for proper functioning of the dynamic add to cart feature, please go to WooCommerce > Settings, and in the Product tab, make sure the checkbox labeled "Redirect to the basket page after successful addition" is unchecked. For more details on how to use WooCommerce, please refer to WooCommerce documentation. 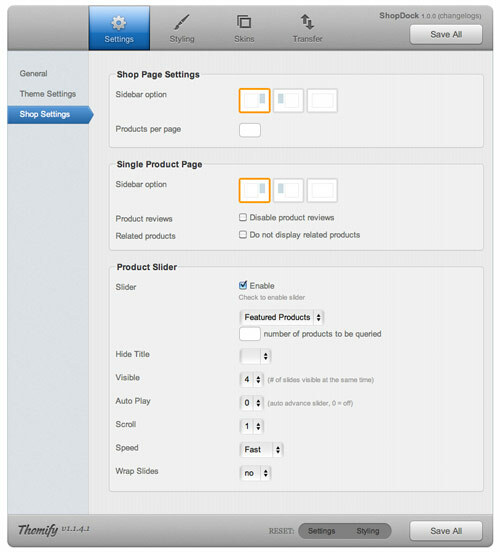 Go to Themify > Settings > Shop Settings to customize the shop page, single product page, and product slider. Go to wp-admin, click on the "Add New" link under the Slider menu. Image width and height is optional. If the field is empty, default image size will apply. 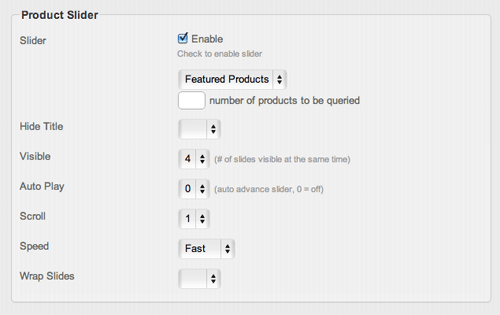 Slider Options can be found at Themify > Theme Settings. To enable the product slider on the homepage, go to Themify > Settings > Shop Settings, check "Enable" in the Product Slider section. Select the product category and enter the number of products to be queried. To link the featured image with a lightbox popup such as image zoom, video or an iframe window, enter the URL in the Lightbox Link field under the Themify Custom Panel. The Themify Custom Panel can be found in the post edit page. It will open a lightbox for you to create and insert gallery. 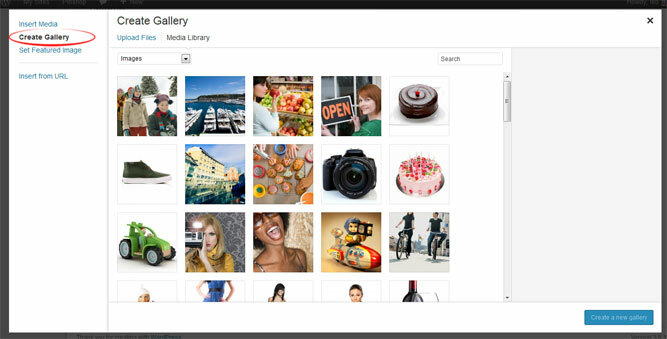 Read this tutorial for more details on how to use WordPress Gallery. Generally, the theme works out of the box. All the sidebar options and image dimensions are pre-defined in the theme. 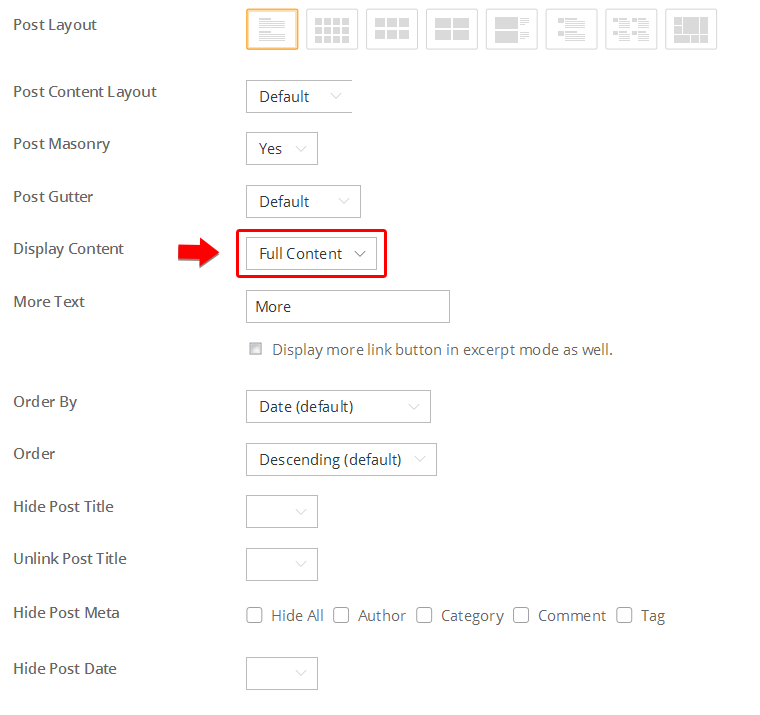 If you need to change the default sidebar options, featured image dimensions, content/except display, post meta, etc., it can be done in the WP Admin > Themify > Settings > Default Layouts. Archive Sidebar Option: refers to the default home page, category, search, archive, tag pages, etc. Default Post Layout: is the post page direct URL (also known as "Single Post"). Note: Some themes may only have 4 layouts. Default Static Page Layout: is the static page. FYI: Read Default Layouts documentation for more info. First, create a new Page (in admin, select "Add New" under the "Pages" admin menu). Order = This option is used to set whether posts will be ordered in ascending or descending order. Order By = This option is used to set the attribute that the order of the post will be based on. Query Post Layout = This option is used to set the layout of posts such as grid columns, list posts, etc. Post Per Page = This option is used to set the number of posts shown per page. Display Content = This option is used to set what content is output for each post (None, Excerpt, or Full Content). Image Dimensions = This option is used to set the dimensions the posts images will be displayed at. Hide Post Title = This option is used to set whether the post title will be displayed. Unlink Post Title = This option is used to set whether the post title will operate as a link. Hide Post Date = This option is used to set whether the post date will be displayed. Hide Post Meta = This option is used to set whether the post meta will be displayed. 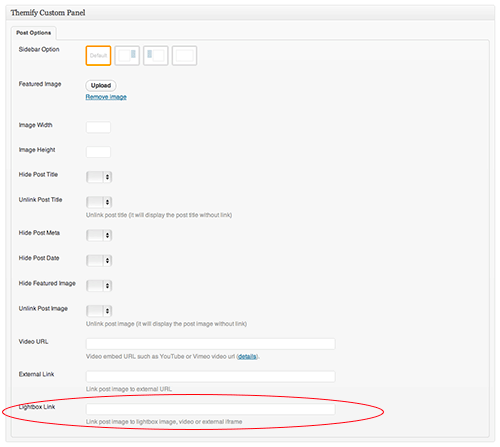 Hide Featured Image = This option is used to set whether the featured image will be displayed. Unlink Featured Image = This option is used to set whether the featured image will operate as a link. 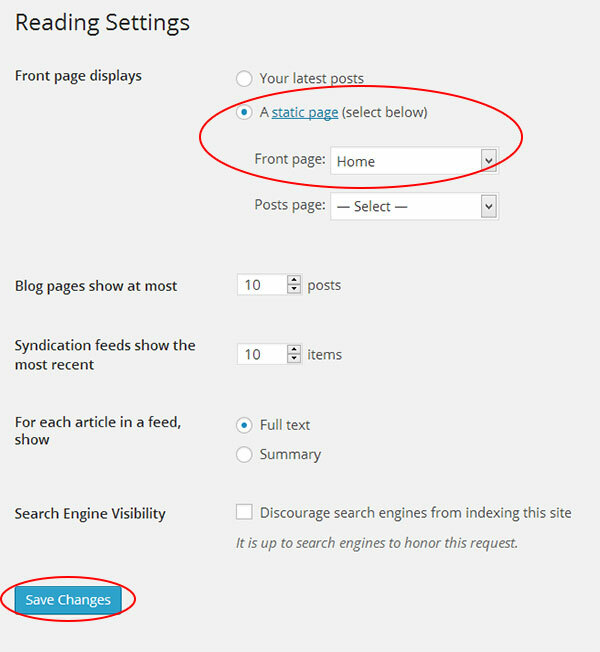 Hide Page Navigation = This option is used to set whether the page navigation for posts will be displayed. Go to WP Admin > Settings > Reading. On the Front page displays, select the "A static page (select below)" option and then select a "Front page". Leave the "Posts page" default. If you want to create a custom Blog page, read this tutorial instead of setting the "Posts page". Go to WP Admin > Appearance > Widgets. The big panel on the left side shows all available widgets. The small panels on the right are the widgetized areas. To add a widget: drag and drop the widget from the left panel to the right panel. To remove the widget: drag the widget back to the left panel (Available Widgets panel). If you want to keep the widget setting for future use, drag it to the Inactive Widgets instead of the Available Widgets panel. It will save your widget settings. To retrieve the widget, drag the widget from Inactive Widgets panel instead of the Available Widgets panel. TIPS: You can also add widgets in Appearance > Customize panel. Go to WP Admin > Themify > Skins, select a skin by clicking on the thumbnail and click Save. Go to WP Admin > Appearance > Customize. It will take you to the Customize panel with live preview where you can style the appearance of the theme design (ie. color, background, font, spacing, border, etc.). FYI: Refer to Customize documentation for more info. To set the Footer Widget column layout, go to WP Admin > Themify > Settings > Theme Settings. To drop the widgets in the Footer Widgets, go to WP Admin > Appearance > Widgets. Go to WP Admin > Themify > Settings > Theme Settings and enter the footer text. 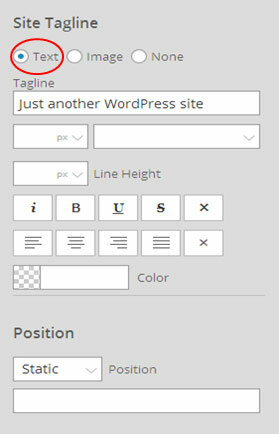 HTML tags are allowed in the Footer Text. To have empty footer text, tick the hide footer text checkbox.